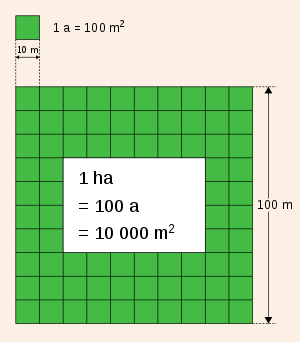 The hectare (/ˈhɛktɛər, -tɑːr/; SI symbol: ha) is an SI accepted metric system unit of area equal to a square with 100-metre sides, or 10,000 m2, and is primarily used in the measurement of land. There are 100 hectares in one square kilometre. An acre is about 0.405 hectare and one hectare contains about 2.47 acres. In 1795, when the metric system was introduced, the "are" was defined as 100 square metres and the hectare ("hecto-" + "are") was thus 100 "ares" or ​1⁄100 km2 (10,000 square metres). When the metric system was further rationalised in 1960, resulting in the International System of Units (SI), the are was not included as a recognised unit. The hectare, however, remains as a non-SI unit accepted for use with the SI units, mentioned in Section 4.1 of the SI Brochure as a unit whose use is "expected to continue indefinitely". The name was coined in French, from the Latin ārea. In 1960, when the metric system was updated as the International System of Units (SI), the are did not receive international recognition. The International Committee for Weights and Measures (CIPM) makes no mention of the are in the current (2006) definition of the SI, but classifies the hectare as a "Non-SI unit accepted for use with the International System of Units". In 1972, the European Economic Community (EEC) passed directive 71/354/EEC, which catalogued the units of measure that might be used within the Community. The units that were catalogued replicated the recommendations of the CGPM, supplemented by a few other units including the are (and implicitly the hectare) whose use was limited to the measurement of land. The names centiare, deciare, decare and hectare are derived by adding the standard metric prefixes to the original base unit of area, the are. The centiare is one square metre. The deciare is ten square metres. The are (/ɑːr/ or /ɛər/) is a unit of area, equal to 100 square metres (10 m × 10 m), used for measuring land area. It was defined by older forms of the metric system, but is now outside the modern International System of Units (SI). It is still commonly used in colloquial speech to measure real estate, in particular in Indonesia, India, and in various European countries. In Russian and other languages of the former Soviet Union, the are is called sotka (Russian: сотка: 'a hundred', i.e. 100 m2 or ​1⁄100 hectare). It is used to describe the size of suburban dacha or allotment garden plots or small city parks where the hectare would be too large. Mål is sometimes used for decare in Norway, from the old measure of about the same area. The hectare (/ˈhɛktɛər, -tɑːr/), although not a unit of SI, is the only named unit of area that is accepted for use within the SI. In practice the hectare is fully derived from the SI, being equivalent to a square hectometre. 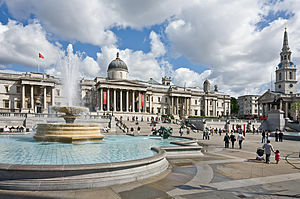 It is widely used throughout the world for the measurement of large areas of land, and it is the legal unit of measure in domains concerned with land ownership, planning, and management, including law (land deeds), agriculture, forestry, and town planning throughout the European Union. The United Kingdom, United States, Burma, and to some extent Canada use the acre instead. Some countries that underwent a general conversion from traditional measurements to metric measurements (e.g. Canada) required a resurvey when units of measure in legal descriptions relating to land were converted to metric units. Others, such as South Africa, published conversion factors which were to be used particularly "when preparing consolidation diagrams by compilation". The most commonly used units are in bold. 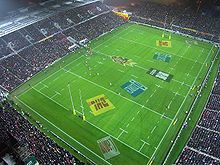 The maximum playing area of an international-sized rugby union pitch is about one hectare. On an international rugby union field the goal lines are up to 100 metres apart. Behind the goal line is the in-goal area (which is also a playing area). This area extends between 10 and 22 metres behind the goal line, giving a maximum length of 144 metres for the playing area. The maximum width of the pitch is 70 metres, giving a maximum playing area of 10,080 square metres or 1.008 hectares. The Statue of Liberty occupies a square of land with an area of one hectare. The Statue of Liberty is located on Liberty Island at the entrance to New York Harbor. Its base is built on eighteenth-century fortifications. The distance between the apex of the bastions in the front of the base to those at the back (where the entrance to the statue is located) is approximately 100 m while the distance between the apexes of the left-hand and right-hand bastions is a little under 100 m. Thus, if a square were to enscribe the bastions, it would have sides of approximately 100 m, giving it an area of one hectare. The grass in the centre of a standard athletic track is a little over one hectare in extent. Athletics tracks are found in almost every country of the world. Although many tracks consist of markings on a field of suitable size, where funds permit, specialist all-weather tracks have a rubberized artificial running surface with a grass interior (as shown in the picture and diagram). The perimeter of the inside kerb of the track is a little under 400 metres, as the actual length of the track is measured 300 mm from the inside kerb. The IAAF specifications state that the radius of the kerb is 36.5 m, from which it can be calculated that the area inside the kerb is 1.035 ha. The soccer field often found inside is normally 105×70 m, or 0.73 hectares. ^ a b c BIPM (2014). "SI Brochure, Table 6". Retrieved 17 November 2014. ^ Oxford English Dictionary, 1st edition s.v. ^ "La loi du 18 Germinal an 3 " la mesure [républicaine] de superficie pour les terrains, égale à un carré de dix mètres de côté »" [The law of 18 Germanial year 3 "The [Republican] measure of land area equivalent to a ten-metre square"] (in French). Le CIV (Centre d'Instruction de Vilgénis) – Forum des Anciens. Retrieved 2 March 2010. ^ Thierry Thomasset. "Le stère" (PDF). Tout sur les unités de mesure [All the units of measure] (in French). Université de Technologie de Compiègne. Retrieved 21 March 2011. ^ "SI brochure (Chapter 4; Table 6)". International Bureau of Weights and Measures. 2006. Archived from the original on 1 October 2009. Retrieved 5 March 2010. ^ "Council Directive of 18 October 1971 on the approximation of laws of the member states relating to units of measurement, (71/354/EEC)". Retrieved 7 February 2009. ^ "are". Oxford Dictionaries. Retrieved 24 December 2010. ^ "are – definition. American English definition of are by Macmillan Dictionary". Macmillandictionary.com. Retrieved 20 May 2012. ^ "SI brochure (8th edition)". BIPM. March 2006. ^ "Decrease in total grain yield". Grain and oil seeds, area and production, 2002. Statistics Norway. Retrieved 16 November 2010. ^ "Market of agricultural land in Bulgaria". BNR Radio Bulgaria. 5 October 2010. Archived from the original on 22 October 2010. Retrieved 16 November 2010. ^ El-Eini, Roza I.M. (2006). "Currency and Measures". Mandated landscape: British imperial rule in Palestine, 1929–1948. Routledge. p. xxiii. ISBN 978-0-7146-5426-3. Retrieved 5 May 2009. ^ "DEPARTMENT FOR ENVIRONMENT, FOOD AND RURAL AFFAIRS, AND RURAL PAYMENTS AGENCY; The Delays in Administering the 2005 Single Payment Scheme in England" (PDF). National Audit Office. 18 October 2006. p. 27. ^ "hectare". Oxford Dictionaries. Retrieved 24 December 2010. ^ Bureau international des poids et mesures (2006). "The International System of Units (SI)" (PDF). 8th ed. Retrieved 13 February 2008. Chapter 5. ^ The Council of the European Communities (27 May 2009). "Council Directive 80/181/EEC of 20 December 1979 on the approximation of the laws of the Member States relating to Unit of measurement and on the repeal of Directive 71/354/EEC". Retrieved 29 January 2010. ^ "Weights and Measures Act 1985" (PDF). British Government. 1985. Retrieved 17 December 2016. ^ "Appendix G – Weights and Measures". The World Factbook. CIA. 2006. Retrieved 8 August 2006. ^ "Instructions for the Conversions of Areas to Metric". Law Society of South Africa. November 2007. Retrieved 21 January 2011. ^ Chisholm, Hugh (1911). The Encyclopædia britannica: a dictionary of arts, sciences, literature and general information. The Encyclopædia britannica company. p. 442. Retrieved 15 March 2012. ^ Oscar van Vlijmen (11 September 2006). "Oppervlakte" [Area]. Eenheden, constanten en conversies [Units, constants and conversion] (in Dutch). Retrieved 15 January 2011. ^ Jacob de Gelder (1824). Allereerste Gronden der Cijferkunst [Introduction to Numeracy] (in Dutch). 's-Gravenhage and Amsterdam: de Gebroeders van Cleef. p. 156. Retrieved 19 September 2012. ^ "Chinese Measurements – Units of Area". On-line Chinese Tools. Retrieved 24 December 2010. ^ François Cardarelli (2003). Encyclopaedia of scientific units, weights, and measures: their SI equivalences and origins. London, Berlin and Heidelberg: Springer Verlag. p. 97. ISBN 1-85233-682-X. Retrieved 29 March 2011. ^ "Thailand Property Conversion". Siam Legal (Thailand) Co., Ltd. Retrieved 24 December 2010. ^ "Law 1 – The Ground". Laws of the Game – Rugby Union 2010. International Rugby Board (IRB). Retrieved 19 December 2010. ^ "IAAF 400 Metre Standard Track Marking Plan". IAAF. 2008. p. 35. Retrieved 11 February 2013. Wikimedia Commons has media related to Hectare. Look up hectare in Wiktionary, the free dictionary.